Hotpoint Emporium is a thriving and creative artist cooperative in the heart of downtown Bristol, RI at 39 State Street. Hotpoint and all its members are in the beginning stages of a community effort to restore a historic landmark. The Hotpoint neon sign! This vintage enamel neon sign, located on top of the building at 39 State Street, Bristol, RI, is in need of desperate repair and is finally getting its chance to re-shine in its original glory. 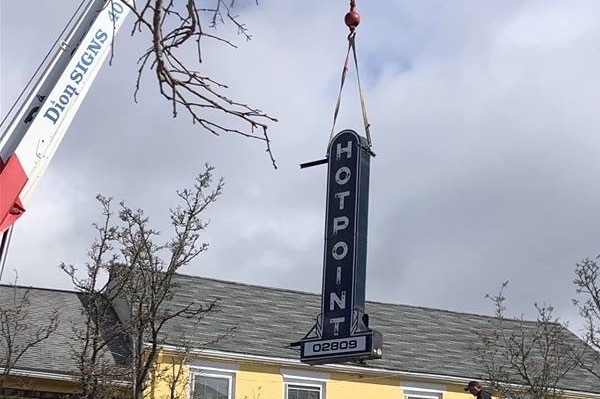 The building owners have graciously put up 50% of the costs related to the removal, restoration and re-installation of this sign and Hotpoint Emporium Co-op is raising the remaining funds through donations and a GoFundMe.com page. Ray from Dion Signs will be removing the iconic sign on Friday, February 22nd to begin its overhaul. Hotpoint Emporium is located in the historic section of Bristol, RI at 39 State Street. 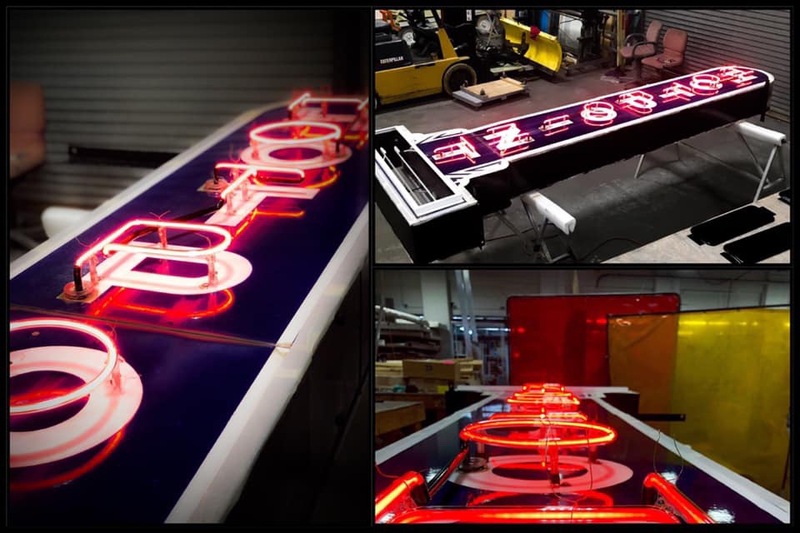 The original sign was manufactured in Lima, Ohio by Neon Signs. The new sign will be restored by Ray Dion, Owner of Dion sign Company in Central Falls, RI. Big day today, Dion Signs spent the morning reattaching the sign to the building, and the rest of the day carefully installing the neon letters by hand. There is still work to be done, the electrical service in the building is going through an upgrade so the sign can be wired in and put on a proper switch with a timer. SAVE THE DATE: The re-lighting celebration will take place on Friday Night, May 10, from 6-9pm. Please consider donating to help us cross the finish line in time! At the end of last month, the restoration team took a trip to visit to Dion Signs in Central Falls, RI to get an update on the sign's progress. Very exciting to see the first side lit up! 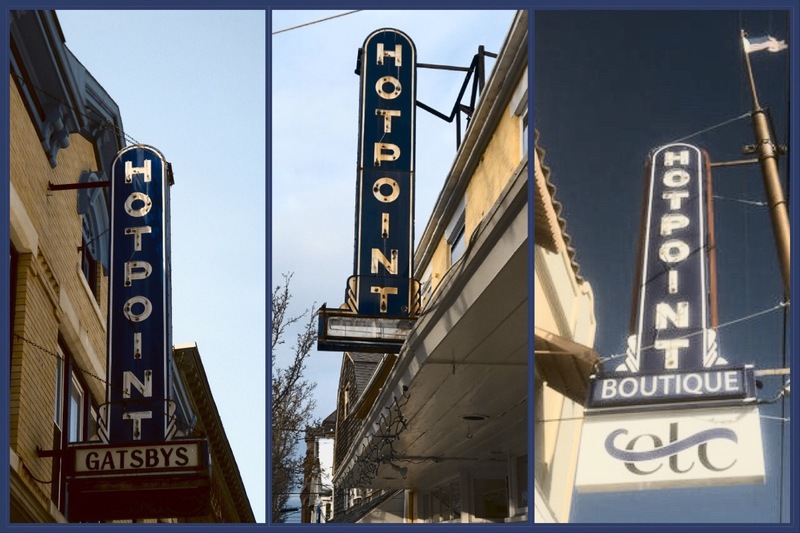 We’ve done some research, and as far as we can tell, ours is one of only three Hotpoint neon signs with the art deco styling that remain in the U.S. The signs gracing the Isha Nelson Gallery in Great Barrington, MA and Hotpoint Boutique in Titusville, FL have both been carefully restored and shine brightly in their full glory. 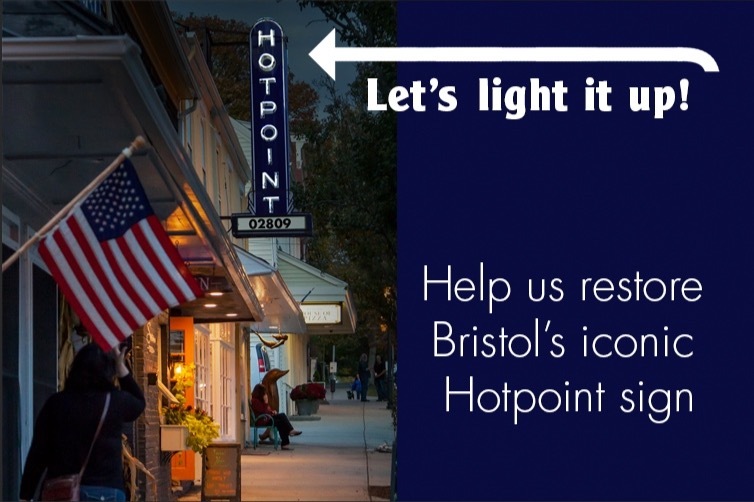 Now we’d like to bring Bristol’s sign back to life, and we need your help. Phase one of the restoration was the removal, cleaning and cosmetic repairs. The hard part is next: measuring and bending all the glass tubes that will be fitted with neon gas tubing before the sign can be reinstalled, hooked up and light the sky once again. Be part of this historic effort, donate today!